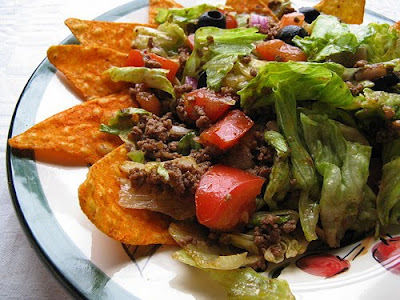 Discription:Here you have a very delicious, simple and easy recipe for taco salad. Many of you probably have a taco salad recipe very similar to this one. It’s perfect for parties.f you’re looking for a fantastic recipe to bring to a party or event – give this a try! Step 1: In a pan brown ground beef along with yellow onions. Add in one package of taco seasoning mix and water as directed on the seasoning package. Set aside. Step 2: In a large bowl mix together tomatoes, lettuce, avocados, cheddar cheese, red onion, olives, and the other package of taco seasoning mix. Add beef mixture and toss until well combined. Step 3: Right before serving – Toss with Catalina salad dressing and add chips.